What’s interesting about that warm feeling the film exudes is that it doesn’t quite start that way. As the film begins, you feel that Sophie is a bit of a bratty loner. 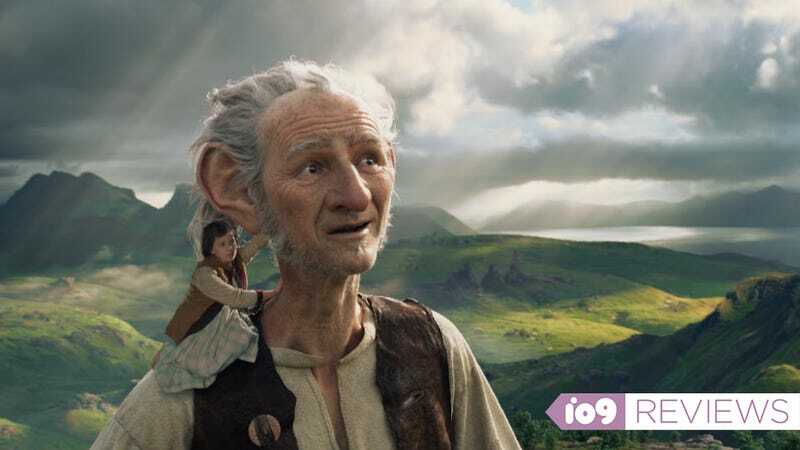 The BFG is also a bit off-putting, as his flighty nature seems to stunt the story. But pretty quickly, the performances start to win you over. Through their actions and interactions, Sophie and The BFG become more heroic, lovable and engaging. After about 10 or 15 minutes of unease, as the story almost too quickly moves ahead, things finally click for the characters. There’s a similar evolution to The BFG’s language, which is a backward, broken English that’s hard to deal with at the start, but at some point becomes almost an in-joke between Sophie and the audience. One place the movie feels a bit thin is the story. The screenplay by the late Melissa Mathison is very faithful to Dahl’s book but, that story is so simple and surface, it never really feels that significant. Things start quickly, the world is built, Sophie buys into everything and before you know it, the story is way off on this fun, but seeming random tangent, before wrapping up. Everything about The BFG is very narratively driven and despite a few fun surprises, the themes are worn proudly, and obviously, on its sleeves. The lack of depth or subtlety certainly under cuts the film’s impact. Overall, The BFG is a really good film that suffers mostly because of circumstance. Steven Spielberg, Disney and Dahl are such powerful names that you expect E.T., Snow White and Willy Wonka rolled up into one. It’s not that. It’s simple, sweet and silly. There’s nothing hugely wrong with it. The visuals are beautiful, the John Williams score is entrancing but it never becomes something more. There’s not that E.T. flying over the moon moment. Belle coming down the stairs or Charlie winning the chocolate factory. A few moments come close, but The BFG never exceeds the expectations it built upon itself. It shouldn’t have to but, with this pedigree, you hoped it would. Expect nothing but a nice little movie and you’re bound to be happy.